"I visited Bluebells last month with my two sisters and my Mum. The tearoom is located in the town of Battle, where the Battle of Hastings, 1066, took place. 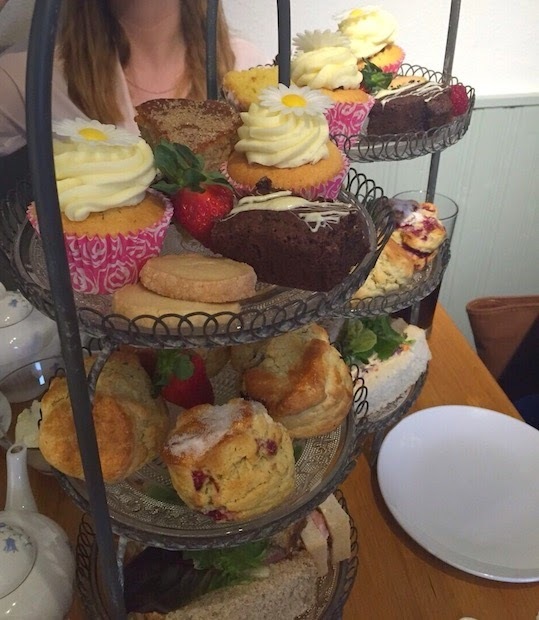 Bluebells tearoom overlooks the Historical Norman Gatehouse, the heart of the town and is a beautiful setting to spend the afternoon indulging the sweet tooth. Bluebells is owned by Tina, and run by herself, her partner and daughter. At once when you enter the tearoom, you get a lovely ‘home comfort’ vibe. The family remain professional with each other but give off a very relaxed and friendly ambience. The tearoom is small and dainty, with two rooms, one significantly more inviting than the other. The front room, with the gorgeous Georgian style window, overlooking Battle Abbey, has a real ‘Shabby Chic’ charm. I was drawn to the gorgeous wooden cabinet with the array of vintage glass cake domes sporting a variety of mouth-watering bakes. 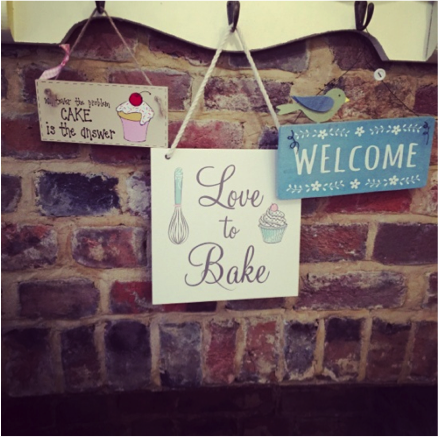 In the same room there is a cosy fireplace which added to the ‘homey’ feel, with cute baking plaques hanging - a lovely touch. The back room, where our table was, unfortunately lacked the same atmosphere. Although it was connecting with a reasonably wide corridor so didn’t seem completely separate from the heart of the tearoom, it did feel a bit bland. Apart from one canvas with a photo of bluebells on, the walls were plain so it was a bit disappointing to be led through the charming front room into the back to our table. We settled onto our table and were given the choice of breakfast tea or coffee. Three of us requested the tea, my sister asked for a soft drink instead and the staff listed the available drinks and said that the replacement wasn’t a problem. Two delicate vintage teapots with matching teacups, sugar cube and milk pots arrived shortly after our order. I noticed the detail of the flowers painted on the china was of course bluebells - a lovely personal touch. I realised quickly when the tea arrived, the lack of space on the table there would be for the cake stands. Due to it being a busy Mother’s Day service, the tables were quite full and so four of us on a table that ideally would be fit for two, especially for Afternoon Tea, was going to be a struggle. When we had been given our drinks, our server explained that every afternoon tea is freshly prepared for a customer’s order. I was pleasantly surprised to hear this, knowing that our food will be made fresh, and ‘just for us’ was teasing my wait for the delicious food I was about to indulge in! We didn’t have to wait long at all, we were presented with two three-tier cake stands both full to the brim with an array of sandwiches, scones and baked goods. My first impression of the whole stand was how generous the portions were. The sandwiches were not your typical small finger slithers, oh no, they consisted of what seemed like a slice of bread for one sandwich, of which we had three each. The fillings were very appetising too: ham & pickle, cheese & coleslaw, and salmon & cucumber. The ham & pickle and the salmon & cucumber both came on soft wholemeal, floury fresh bread. The cheese & coleslaw sandwich was made with a soft white bread. All three varieties of sandwiches were very delicious and moreish. The cheese & coleslaw, a combination that I hadn’t had since my childhood, was my favourite of the three. Never before have I enjoyed that first layer of an afternoon tea as much as I did at Bluebells! After already filling ourselves with sandwiches it was onto the scones. 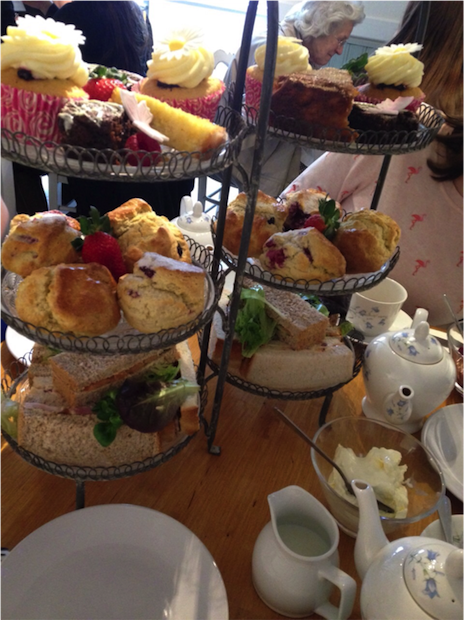 We had two each and there were a variety of types of scone that the four of us could choose from (or fight over!) including raspberry, blueberry or plain. Once again, the sizes were very generous and pleasing to the eye. They were clearly freshly baked, still soft on the inside but with a crisp glaze. The raspberry scone along with the tangy raspberry jam and thick clotted cream was just heavenly. After demolishing the scones we were really starting to feel full but the cakes and biscuits awaiting us looked just too good to refuse. On the top layer was a plateful of different baked goods. For each of us there was a chocolate brownie, a raspberry cupcake with a beautiful piped vanilla swirl and wafer flower on top, a few chocolate dipped strawberries, a shortbread round and a slice of lemon drizzle cake alongside a large slice of apple cake to share. We ate the brownie first - they were gorgeous. Crisp and cracked on the outside yet chewy and melt-in-your-mouth on the inside. The shortbread had a good crunch but still buttery and lovely. We were really struggling to eat everything by now but luckily we were offered the Bluebell’s takeaway box to put the rest of the bakes in. After finding enough room to finish the tea, I can confirm the cupcake was a light vanilla sponge cupcake with a raspberry inside. I didn’t try the apple cake but my mum said it was delicious and the lemon drizzle cake had just enough tang to it and was lovely and moist. Overall the top layer of the tea offered plenty of variety to cater for different types of sweet tooth. All the bakes were clearly freshly baked, very good quality - just mouth watering. The service we received was fantastic. The three members of staff clearly care very much for each and every customer and go above beyond to give good service. From replacing the drinks from the menu to suit our needs, asking for more milk for our tea and providing us with the takeaway boxes, the service we received was top notch. The staff are welcoming, friendly and easy to talk to adding to the relaxed and friendly atmosphere Bluebells offers. I am already making plans to return to Bluebells. From the first impressions of their home baking, cosy family vibe to their freshly baked delicious food, I can hardly find a fault in this charming Battle tearoom." Bluebells Café Tearoom is located in Battle, East Sussex. Afternoon Tea is served daily at £12.95pp. For more info visit www.bluebellstearoom.co.uk. Holy crap that's an impressive serving. I often find with afternoon teas that it's a bit too much. You think it's all tiny food but it's really filling.